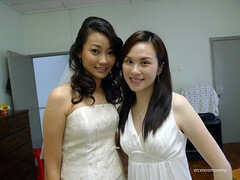 It was one of my best friends’ wedding on the 8 Mac 09. I was honoured to be one of her chi-muis (8 guys and 3 girls ; yes.. my dear friend actually had some of her guy friends as chi-muis. Will post a pic of them when I get hold of it). It was such a fun filled and memorable occassion. There were many funny moment throughout the day. I had a swell of a time. Congrats again to Chua and Iryne and thanks for inviting me to be apart of your day. Me and the beautiful bride. Taken while the heng tais and the rest of the chi muis were having a ‘war’ downstairs. 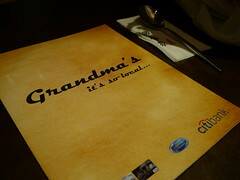 No, not my biological Grandma :D It’s actually a restaurant located at United Square. 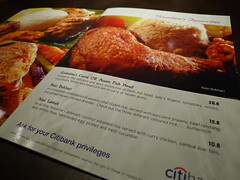 We had read about this newly opened restaurant whose chef used to work for Madam Kwan in KL some time back on the paper. So when we found out they opened a new outlet in United Square which is much nearer to our place, we were obviously thrilled. 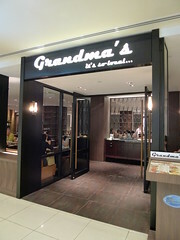 I have always loved Madam Kwan’s nasi lemak and a visit to this Grandma’s is a must. Can’t helped but to witness the close similarity to Madam Kwan’s. They used the same theme colours. 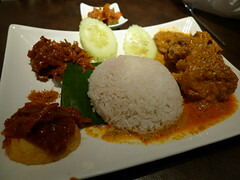 Nasi Lemak. Looks good but disappointing taste. The curry chicken was too salty and the sambal was too sweet to my liking. 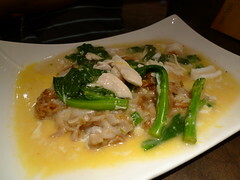 Fried Hor Fun. Hubs said it was too bland. 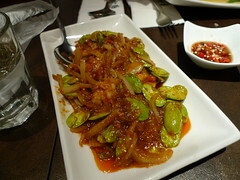 Sambal Petai. I never liked petai but somehow this gets a thumbs up from hubs. It was such a coincidence that Chew Lee and I will be in KL the same time last week. We know it will be awhile before we are able to meet up again so we made a point to at least catch up for drinks last Sunday (22 Mac 09). The last time we met up she was still heavily pregnant. 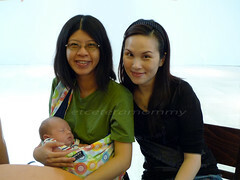 Now, baby Kelsey is already in her arms, sleeping soundly most of the time, totally oblivious to his noisy surrounding at Starbucks, Pavillion. Me and the Chewlee with the new addition to their family. Baby Kelsey is such a handsome boy with blond hair and sharp nose. Soon after, they were all over each other. Ryan as usual could not stopped hugging and holding Malaika’s hand. The last time the kids met and played together was some time back last year. 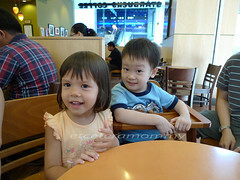 They were still in Singapore when we would each each other frequently. That time the kids were still pretty much playing individually, not quite with each other. How time flies.. we met again this year and now the kids were inseparable especially when it comes to play. 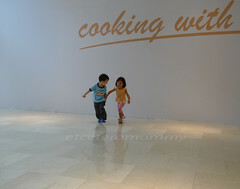 Simply love to watch them happily playing. So innocent, so carefree, so happy…. After 2 years finally my blog gets a new header. Yay!!! I have two special blogger friends to thank for this special gift. One is its designer, this hot super mama to J and J who is forever so creative with spilling sense of humour. The other who helps me with the uploading is also a super mama, she takes absolutely beautiful pictures especially those of her daughter. It’s when looking at those beautiful pictures of Rachael that makes me yearning for a daughter. Thank you gals!! You both make my day!!! Big muaks. - Ryan started Nursery 1 when he was 33 months. 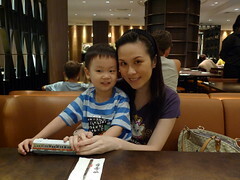 - When I asked Ryan who is his favourite teacher, he would answer Mrs Goh without hesitation. Unfortunately Mrs Goh has moved on and no longer teaching the class. She is replaced by Ms Sng, another likeable teacher. Ryan also like Liang Laotsi but due to communication gap (Liang Laotsi teaches Mandarin in class) inevitably most of the kids are closer with the English teacher. - I normally pack some food for Ryan’s snack time considering his fussiness when it comes to his food intake. 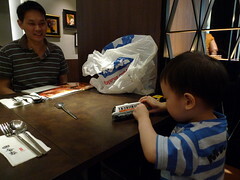 However, after 3 months in school, we are witnessing a great improvement in Ryan’s appetite. He is definitely more adventurous with food now than he had ever been. He is still picky at times but at least he is willing to try. I’m very pleased. - Ryan’s concentration also improves. He is now able to do simple tracing exercise. He could use his magic pointer (index finger) to follow the outline of shapes and patterns without assistance. His favourite home activity for now is the maze activity. He could complete the exercise using his magic pointer or a color pen. I like this exercise as it’s very good for his brain training. Makes him think. LOL. There are plenty of sources on NickJunior, Cartoon Network websites. - Ryan is also improving on his ability to join the dots. He absolutely loves this activity. Normally I would outline the dots and Ryan would complete the exercise by joining the dots I drew. We’re currently doing this on a piece of small white board. So there are a lot of drawing, erasing, drawing, erasing again and again. It’ll definitely be less repitition once I get my hands on a laminator. - Temperament is still very good. *touch wood*. Generally Ryan’s a happy baby and always put on a smiley face which is very pleasing. ryan loves school. Something which I’m extremely thankful as it makes the whole morning wake-up rituals much more easier. At 7.15am everyday, all I need is to turn on his favourite Backyardigan show on Nickelodeon. He’ll spend the next 15 minutes drinking milk and watching his show while the parents get ready. - Despite his occassional misbehaviours, Ryan is always a loving baby with great affections for others. He’s very generous with hugs and kisses. Not sure if it’s a good thing. He would go around hugging and kissing his teachers and classmates. Those who are more reserved are terrified of him (account from the teachers). 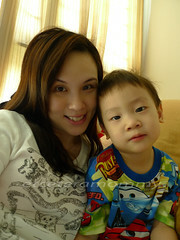 He’s also quite a charmer (sweet talker) especially to his mommy, that’s me *blushed*. At home, it’s a normal scene for Ryan running after me saying “mommy, I miss you a lot a lot a lot” eventhough I was just gone for a short while to the toilet or when I was lazing around in my own room. During school dismissal, he would run to me, hug me and ask ‘mommy, why you so long. I miss you‘. Ultra sweeeeettttt…. ho lum er…!! 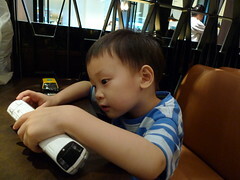 - Ryan is very into cars eversince he watched the Disney/Pixar Cars movie. He’s not only into the Cars characters but also cars in real life. He can now name most of the cars we see on the road by looking at the logo which includes BMW, Mercedes, Honda, Toyota, Mazda, Mitsubishi, Nissan and Audi. For BMW, he is able tell its brand by looking at the car design alone. - Ryan is still taking Isomil (mix one scoop of Pediasure). He drinks much less milk now that he goes school in the morning. In a day, he takes about 3 – 4 feeings of 5/6 oz milk. 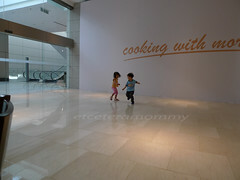 - He is almost potty trained and diaperless in school and at home except sleep time and during long journey outings. - He’s no longer a fan of Ultraman. All his 20 odd Ultraman(s) and monsters are now sitting in the corner collecting dust. His current favourite is Toys Story and Disney/Pixar Cars. Ryan and Sarah. Absolutely cute girl and I love love love her hair.